It's worth persevering with Rued Langgaard. His music is so genial and unprepossessing that it is all too easy just let it pass you by. But repeated listening reveals all sorts of complexities and unique stylistic traits. There are plenty of flaws of course, and in the case of these string quartets the worst is their continual striving for symphonic scope, which is always frustrated. But beyond that the sheer originality of the music, its skilful melodic construction, and its vast array of colours and moods makes it well worth hearing. 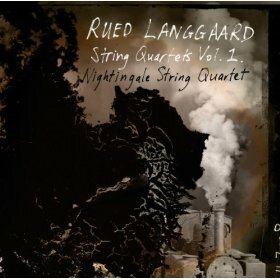 The string quartets are all products of Langgaard's industrious youth. His late-Romantic aesthetic, when applied to the string quartet format, comes out sounding like something between Delius and Janacek, although considerably closer to the former. The numbering of the quartets is all over the place, and although the quartets here are numbered 2,3 and 6, the sixth precedes the third by five years. Quartet No.2, with which the programme opens, has titles for each of its movements, some of which - Landscape in Twilight, The Walk – don't instil confidence that the music is going to be of any interest. Fortunately, these are the movements where Langgaard is at his closest to Janacek, mixing tone painting with a slightly folky/modal nationalist idiom. The second movement is entitled 'Train Passing By', and Langgaard does a great job of representing the repeated, insistent sounds of a steam engine, yet without resorting to Mickey Mouse sound effects. The result is closer to Steve Reich's evocation of trains than it is to Honegger's, but it stands favourable comparison to both. The Third Quartet, rather than giving programmatic titles, has movements named 'Rapacious', 'Artful' and 'Scoffing'. Again, the character of the music closely matches the intended moods. The titles sound surprisingly like those of Nielsen's Second Symphony, considering the antimony between the two composers. The Sixth Quartet is in a single movement, but ironically is the most sectional of the three. It's structure is innovative, but seems entirely stable, at least until a curiously naïve sounding folk tune is added in at the end, for no readily apparent reason. And the programme concludes with a set of variations on a chorale, a work of similar scope and standing to the preceding quartets and with an impressive sense of continuity across its seven variations. The Nightingale Quartet give fine performances, expansive and expressive but also tightly controlled in technical matters of tuning and ensemble. Romantic as this music is, there is plenty of scope for different interpretations, and a more formal, neo-Classical approach might serve these quartets just as well. But the Nightingale Quartet never take any of their dynamic or rubato indulgences to excess, so the music is well served by their readings. The sound quality is good, although you'd be unlikely to tell that it is an SACD without reading the box. The concert hall venue gives a curious resonance, not distorting as such, but adding a slight boxy edge to the sound. The packaging is very elegant and the liner notes are comprehensive, suggesting that a great deal of care has gone into the production of this disc. The Danish Langgaard revival continues apace, and if future contributions to it are of this quality, he may yet find a meaningful place in the repertoire.